This collection of translations of Bill Watterson’s The Revenge of the Baby- Sat probably got started when I went to Italy in 2002 and chanced upon a copy of the Italian translation. Undoubtedly I bought the Portuguese one in Portugal in 2004 and the German one in Germany in 2008. My husband fetched me the French one from France at some point or other, having somehow determined that the contents were the same even though the cover was different. A neighbor kindly brought back the Chinese version for me when she went to visit family in Beijing recently. 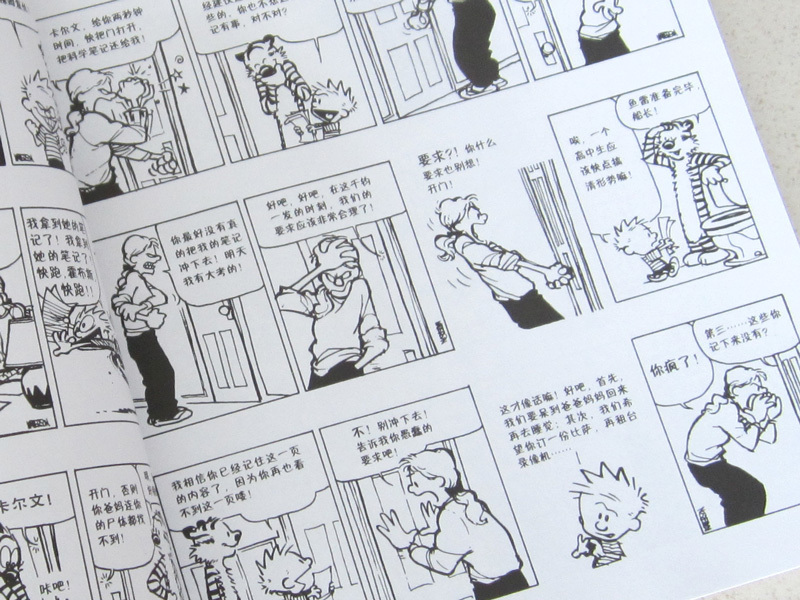 Seeing Calvin’s words in other languages that use the Roman alphabet is one thing; seeing them in Chinese characters is quite strange. Below are images of the six different book covers: French, Italian, Portuguese, German, English, and Chinese. I thought I disliked Olaf the snowman because he falls apart all the time, but I didn’t dislike Miguel’s skeleton ancestors in Coco when they fell apart (over and over again) in the oddly godless land of the dead, so it must be something else about Olaf that rubs me the wrong way. Sadly, the creators of Frozen made him the central character in the animated short Olaf’s Frozen Adventure, which played before Coco. Coco was totally worth the wait, however. The storytelling was crystal clear, emotional, and well-structured, with appropriate foreshadowing, lots of call-backs, and some stunning visuals. I couldn’t believe that a couple of adults next to me in the theater found it hard to stay awake; I found it hard not to cry. Coco is the story of Miguel, the youngest in a long line of Mexican shoemakers. Coco is Miguel’s ancient great-grandmother. Coco and her mother were abandoned by an aspiring music man, so no one in the family is allowed to sing or play an instrument. They’re all fine with that… except Miguel. He wants nothing more than to be allowed to develop his musical talent. Eager to prove himself, he tries to steal the guitar from the tomb of a famous local musician so he can enter a competition being held as part of the town’s Day of the Dead celebrations. The theft doesn’t go as planned, and Miguel finds himself on a quest that teaches him about the dangers of ambition and the value of family. It was pretty weird seeing a story about European winter traditions in a theater in tropical Southeast Asia, where Chinese New Year is a more important family holiday than Christmas. Here, if Christmas is commercialized, it’s at least partly because many people aren’t actually Christian. This Christmas featurette stars Olaf, who I never liked, being just as annoying as ever. His broken-fourth-wall deadpan comments failed to amuse. Meanwhile, Anna and Elsa were so perfect as to be utterly boring, and Christoff was milked for awkward gross-out humor. I didn’t like the feature film Frozen much to begin with, but Olaf’s Frozen Adventure was terrible. I’m not the only one who didn’t like the short. The reasons mostly seem to be that Pixar usually produces shorts that are surprising, cute, and clever, whereas this one was dull and obviously commercially motivated, and not even all that short. I did catch Elsa saying “I’m sorry”—which she never does in the entire movie where she’s kinda (but not really) the villain. So there’s that. Old Singapore coin: It’s a lucky day when you find one of these! Singapore has only been a country since 1965. It has only had its own coins since 1967. This ten-cent coin is from 1968, and belongs to the first series of Singapore coins, which featured sea animals. The second series (introduced in 1985) featured flowers. There were two versions of the coat of arms, one with the banner bowed upwards and one with the banner hanging down. Supposedly the coat of arms was changed for better feng shui, because when the banner is hanging down, it looks like a smile rather than a frown. The octagon inscribed in the circular one-dollar coin is thought to be lucky. The third series of coins (introduced in 2013, after I came to Singapore) involved changes in the metal composition and size of the coins as well as the designs, which are now more architectural. The new coins have mostly displaced both second series designs, though I still get some mixed in with my change. It is quite rare to see a first series coin in circulation now. Below are a handful of photos I took on the way from the Asian Civilisations Museum to the monthly Hungry Hundred Book Club meeting at Boat Quay. My husband and I went to the Asian Civilisations Museum. We walked through all the exhibits that were open. We saw the Tang shipwreck exhibit, the Chinese scholar exhibit, the Chinese ceramics exhibit, the performing arts exhibit, the trade exhibit, the Islamic foyer, and the ancient religions exhibit. Below are notes on a couple of the things we saw. How does he escape, what is the plan, and how does he stop his boss? Watch the movie! Or see below for a plot summary with SPOILERS in the form of a beat sheet in the style described in Blake Snyder’s Save the Cat. Since there were a lot of ways the sequel to the bizarre, Asianesque sci-fi noir classic Blade Runner could have been awful, I was expecting Blade Runner 2049 to be handled about as well as Indiana Jones and the Kingdom of the Crystal Skull or Ghost in the Shell, both of which failed to delight their devoted target audiences. I was pleasantly surprised. 2049 has some disturbing violent moments, and the whole finale is one of those water scenes I really dislike, but I enjoyed it more than the original, I think because it generally made more sense, or because of some beautiful, colorful architectural shots, or perhaps simply because it was new and therefore I did not feel obliged to like it simply because, for two or three decades, other people already had. There’s a lot of chatter about this movie’s ties to the original, and about philosophical questions relating to memory and the soul, but for me the movie is about the journey from blissful ignorance through mistake or self-deception to self-knowledge and finally acceptance. Ignorance is never bliss, and you always have a choice.